Count on PLUMBPROS Plumbing to be there when you need a sump pump installation or repair. Have you smelled musty odors or seen signs of mold in your basement or crawl space? Is your home in a low lying area or sitting near a body of water? Has your basement or crawl space ever flooded? If the answer to any of these questions is yes, you may need a sump pump. Many homes with basements or crawl spaces will need a sump pump installed. Over 60% of American homes have wetness below their property. A sump pump will keep this area under structures dry and prevent any flooding. A sump pump is used to pump out water that has collected in a container located in the lowest part of a home's basement or crawl space. Here in Georgia, we have plenty of rain and many people live near bodies of water. If the basement in a home lies below the water level, or there has been significant rain fall, all of this excess water will enter the sump container. Once the water level reaches a certain height, the pump will pump the water to a non threatening place outside and away from the house. Sump pumps are also a wonderful way to reduce dampness. With high levels of humidity in Georgia, many of our basements can smell musty and feel wet. A sump pump will help dry out these areas. There are two types of sump pumps: a pedestal sump pump and a submersible sump pump. With a pedestal pump, the motor is mounted above the basin. This type of pump is louder and more conspicuous, but also less expensive. A submersible pump is completely encased by the sump. It is more expensive and harder to maintenance, but also less noticeable. A sump pump consists of 2 pieces: the container that collects the water and the pump. Most of the basins hold about 15-25 gallons of water and the pump can be electrically powered, battery powered or both. They can be less expensive with a manual operating system. This means that you would turn on or off the system when needed. The other option is an automatic system, which is more expensive, but also more convenient. It will turn off and on when needed on its own. While a sump pump is generally wired into the structure's main electrical system, it is wise to have a battery backup. A deep cycle boat battery is the best choice. This type of battery will be constantly charging while the electricity is on, leaving it at full charge if the power ever goes out. The most popular brand for sump pumps seems to be Zoeller. Zoeller is American made and constructed of cast iron. Some other brands that tend to rank well are: Liberty, Superior, Wayne and Basement Watchdog. Once it's time to install your new sump pump, it is recommended to be done by a licensed plumber. You will want to make sure that the pump is plugged into an outlet with a ground fault circuit interrupter (GFCI) to prevent electrocution. The pump will always be near water, so this precaution is a must! Also, ensure that the pump is plugged directly into this GFCI outlet. Extension cords should never be used. 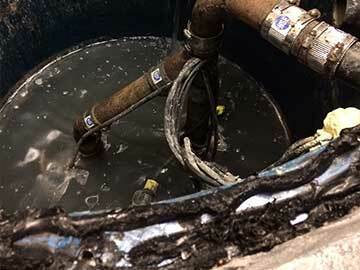 It is important to keep your sump pump system maintained and in good working condition. Ideally, the equipment should be checked each year. If your pump runs often, it should be checked more than once a year. 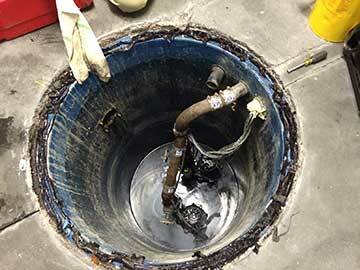 The best way to extend the life of your sump pump is to keep it clean from dirt and debris. This can get into the lines, causing clogs and making the system work too hard. There are battery powered alarms that can be installed to sound if the water level reaches too high. Since a sump pump will eventually need repairs, it is a wise idea to have a backup system. This backup system can save you thousands of dollars in damages. On occasion, pour a bucket of water into the sump pit to make sure the pump automatically turns on and the water is moved out efficiently. In Georgia, we are often in danger of flooding. We routinely have wet springs and summers. With so many people living in low lying areas or near water, flooding causes thousands of dollars in damage to homes all of the time. It only takes a small amount of water to wreak havoc on a home's foundation, basement, and personal belongings in basements. A sump pump can reduce or eliminate mold in your basement, resulting in healthier living. Not only will it make your basement healthier, it will protect the possessions you have stored there. Sump pumps are common in new construction homes due to the fact that their value has been recognized. In summary, if you smell mold or feel humidity in your basement, don't hesitate! Give us a call and let us determine the type of pump best suited for your situation. If kept in good repair and maintained regularly, your new sump pump will provide your family with years of comfort and peace of mind.